. Really? Who would have thunk it? The firestorm of debate ignited by Gov. Scott Walker’s changes to collective bargaining rules last year also triggered an explosion of requests for public information from his office. The office received 214 written requests during 2011, some three times more than the previous governor saw just a few years earlier, Gannett Wisconsin Media found while checking public records activity as part of a Sunshine Week open-government initiative. The analysis, involving more than 700 pages of documents, also showed that about 1 in 5 requesters got records within a month. Others waited as long as 120 days or more. The volume of requests last year “probably has a lot to do with a lot of the budget reforms,” said Cullen Werwie, a spokesman for Walker. The Plot Thickens in Wisconsin: Did the Governor Create a Parallel E-Mail Universe? Milwaukee County prosecutors also made the surprising disclosure that top Walker aides set up a private Internet network to allow them to communicate with one another by email about campaign as well as county government work without the public or co-workers’ knowledge. The emails Walker officials traded via the shadow network could provide investigators with a trove of information as they pursue other angles in the case. Earlier this week, the Journal Sentinel reported that the probe was focusing on possible bid-rigging and other misconduct in the competition to house the county Department on Aging in private office space. The office of Gov. Scott Walker has agreed to a settlement in a lawsuit brought by Isthmus newspaper and the Wisconsin Associated Press over access to emails sent to the governor in response to his “budget repair bill.” The settlement requires the governor to produce the emails and pay attorney fees for the plaintiffs’ costs in bringing the suit. In exchange for this access, the media requesters have agreed not to use the names of individuals who have sent emails to the governor in cases where there is reason for withholding them, as when they contain personal medical or financial information or raise a concern about retribution. The requesters also agreed not to use, publish or disclose any home addresses, email addresses, telephone numbers or Social Security numbers that may be contained in these emails. Attorney Christa Westerberg represented Isthmus and the AP in this action; the governor and his office were represented by Assistant Attorney Generals Clayton Kawski and Mary Burke. The governor’s chief legal counsel, Brian Hagedorn, also took part in the case. A soap opera within a soap opera in Wisconsin….just keeps getting better. This was a fabulous FOI request! 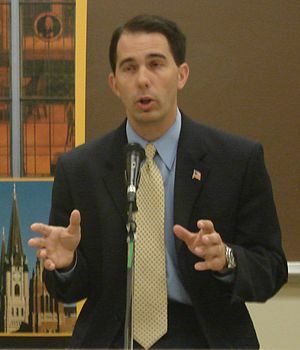 Unfortunately, it seemed at times during this hearing that the release of these emails – which Walker has characterized as being mostly positive – might happen later rather than sooner. This even though there was no dispute that they are public records, or that the media requesters and governor’s office were not very far apart in terms of reaching an agreement that could provide access. At his press conference on Feb. 17, Walker said his office had received more than 8,000 emails in the week since he unveiled his proposal to extract benefit concessions and rein in collective bargaining rights from most public employees. He said the “the majority are telling us to stay firm, stay strong, to stand with the taxpayers.” At another press conference the following day, Feb. 18, he said the number of emails had risen to more than 19,000. This statement was made within an hour of Isthmus hand-delivering a records request; the Associated Press made its own request earlier that day. The governor’s office did not respond to either request until about two hours after the lawsuit was filed last Friday, March 4, although both the AP andIsthmus sent follow-up e-mails asking for updates as to the status of their requests. At Tuesday’s hearing, this failure to respond was chalked up to “a clerical oversight”; Judge Fiedler, while not doubting this, said it seemed obvious to him that the sending of these responses was triggered by the filing of the suit. Isthmus newspaper and the Wisconsin Associated Press today filed a lawsuit against Gov. Scott Walker over his office’s failure to respond to open records requests regarding emails received by his office. The lawsuit, filed this afternoon in Dane County court, names as defendants Gov. Walker and the office of the governor. Isthmus made its request by hand-delivered letter on Feb. 18, a day after Walker referred to these 8,000 emails and about an hour before he held another press conference saying the number had since swelled to 19,000, again mostly positive. The paper followed this with two communications with Walker spokesperson Cullen Werwie (the second of which, on Feb. 24, was also sent to Brian Hagedorn, the governor’s legal counsel). Both asked for an update on the status of the original request.